Douglas Wilson is at his best when writing on familial issues, and Reforming Marriage is no exception. 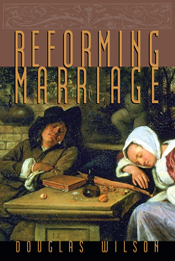 While Standing on the Promises and Future Men focus more on child rearing, this work addresses marriage, with topics such as gender roles, reconciliation, birth control, child rearing, sexuality, and divorce. Among Wilson’s strengths is his call for men to awake from their stupor of irresponsibility and reclaim godly leadership in the home. He addresses wives, but directs more of his comments toward husbands. For example: “When a couple comes for marriage counseling, my operating assumption is always that the man is completely responsible for all the problems” (32) and “wives are much more likely to be wronged by their husbands than the other way around (133). A possible weakness may be that because the book is so heavily geared toward rebuke and admonition toward the husband (which I applaud), it may not be as helpful a read for wives. Wilson is known for being a funny, witty writer, so this could be a fun read with your spouse. That sounds like a great read. The quotes you included were helpfulas well. This post just gave my wife and I a great lunch discussion. And there are only three reviews on Amazon, could you postyours there as well?